Welcome to Read Design Window Fashions! For over a quarter century the Read family has happily served DFW area households like yours with the ultimate in drapery, shade, and blind options. Our knowledge of the latest advances in window coverings and our sterling customer service have given us the honor of being an official Hunter Douglas dealer. 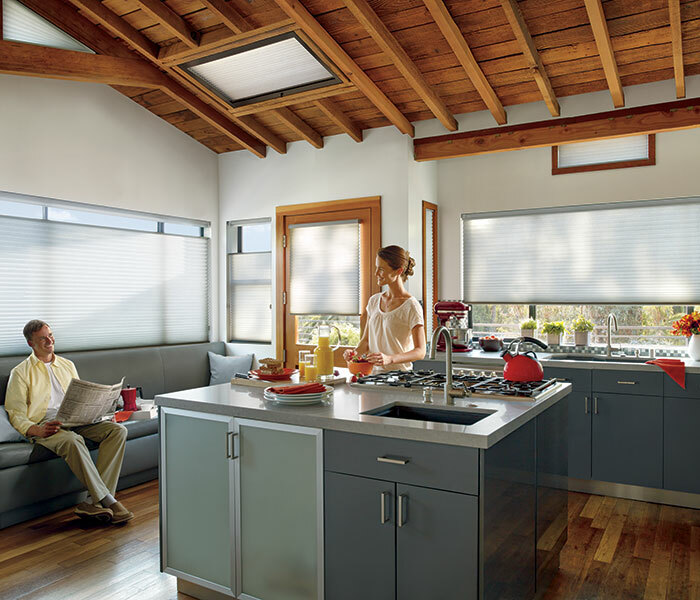 This hallmark for our window treatment store means you can get amazing options such as this brand’s invention, honeycomb cellular shades that use trapped air as insulation. Thanks to Hunter Douglas’ Lifetime Guarantee and Right Choice Promise, you can always shop confidently for your window treatments here! Whether you prefer traditional shades or something more textured in patterned fabrics or even bamboo, our window treatment store is ready to assist in maximizing your purchase’s light control and privacy features as well as looking great! You can even schedule when your new shutters or blinds open and close with a remote or even an app and one of our excellent Hunter Douglas motorization options. Ask about our operating systems especially safe for homes with children and pets. Read Design Window Fashions staff will go the extra mile to make sure your window treatments are perfect. Our concern for your happiness doesn’t end with the installation and follow-up call. We streamline the window-treatment shopping process to make it hassle-free. Is the information overload of so many choices making you unsure? Not to worry. Our interior design service will help you make the right choices for your color, light, and energy-saving needs. With us, you get one FREE consultation! So when it’s time to design phenomenal shades or blinds for a new home or replace dingy or dated draperies, rely on DFW’s premier window treatment store. Peruse this site to get a good idea of the variety of products and services we can do for you, then visit our Plano, TX store to make your interior design dream come true. Thank you. It was a good and easy experience. I will for sure use your expertise in the future. Rick was great. Love the fast and friendly service. Look forward to working with y’all again. Happy customer. Thank you for fixing our Hunter Douglas blind and ordering magnets for our shutters. I cannot believe it was done the very next day. You all are the BEST! I now know where to come and who to recommend for window treatments. But most of all thank you for being so nice. I have really enjoyed working with Kate, her professionalism demonstrates an outstanding job representing Read Design Associates. My daughter just put an offer in on a condominium and we will be having Kate come out and measure for Hunter Douglas Shutters for her new place! Kate and Julie were fantastic; we ordered plantation shutters and pleated shades for our skylights for our new home. The price, service, quality and installation were superior. We recommended them to three of our friends for shutters for their new homes and they were pleased as well. The blinds are perfect and the installer was very entertaining!